From “Tour of Waterfalls in Various Provinces”. The round opening, through which the waterfall flows, owes its name to the shape of the third eye on the forehead of the Amida Buddha. Since its location, like that of the Ono Falls (in cat.185), can also not be clearly ascertained, it is possible that this composition is a product of Hokusai’s imagination. In contrast to the three other Hokusai water falls in the Riese Collection, this print lacks the seals of the publisher and the censor, which would seem to indicate that it is a later edition. Two men are seated on mats on a cliff beside the great waterfall. Neither of them are looking at the waterfall itself, however, but one seems to be pointing to a pine tree clinging to the cliff across from them. Beside them a servant is heating a kettle suspended on a tripod of sticks over a fire, probably containing water for tea. Lacquer boxes with food in a carrying case rest on the mat before the two companions. 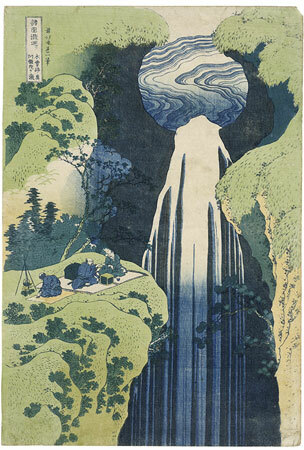 It has been suggested that the circular opening out of which the cascade flows resembles the third eye in the forehead of Amida Buddha and it was thus that the waterfall received its name; or thus that Hokusai, hearing the name of the waterfall, decided to depict it, since the waterfall, like that of Ono, has not been precisely located along the Kiso Road. Reproduced in: Ingelheim catalogue, no. 114.